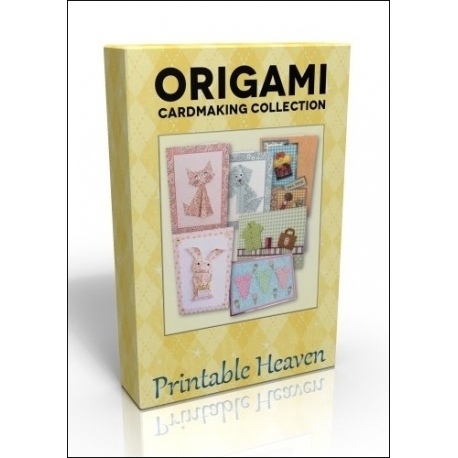 This DVD is crammed full of 21 digital card kits, each featuring an origami embellishment such as cats, dogs, bunnies, shirts or swimsuits. 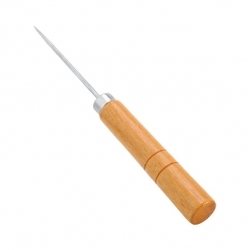 Some of the kits also include miniatures to print and make for an extra special card. There's also another set of 24 sheets to make even more cards. In total there are over 150 sheets on this DVD to print and fold! Each kit also includes full instructions for making the card along with all the origami folding instructions with step by step images. 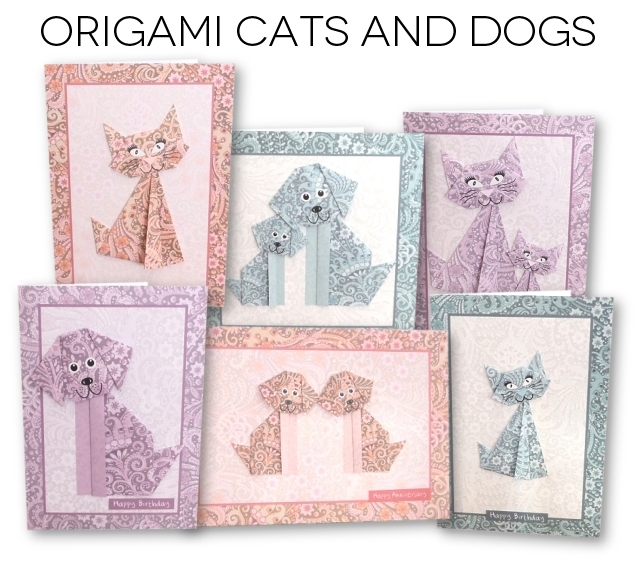 Create beautiful origami cats and dogs in two styles in super-fast time using our step-by-step picture instructions and our easy-peasy pre-printed sheets, complete with folding lines. 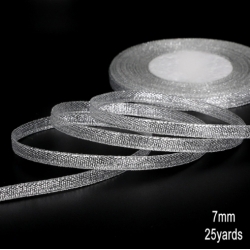 Each kit contains 6 x A4 sheets to print in PDF format. Origami shirts have always been extremely popular for card-making but we've now gone one step further and produced some ready-done shirt papers that have guide-lines printed on them, making them a real doddle to make! 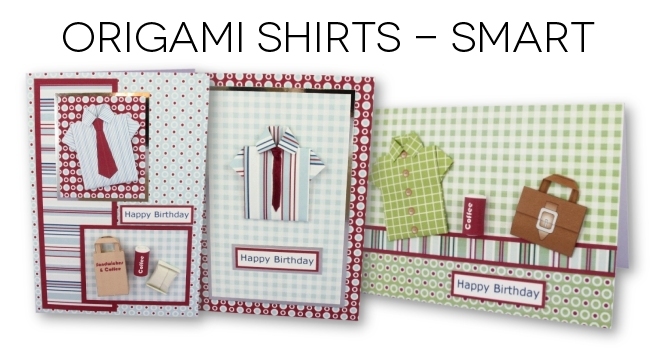 These fabulous modern origami shirt cards are completed with miniatures to match. 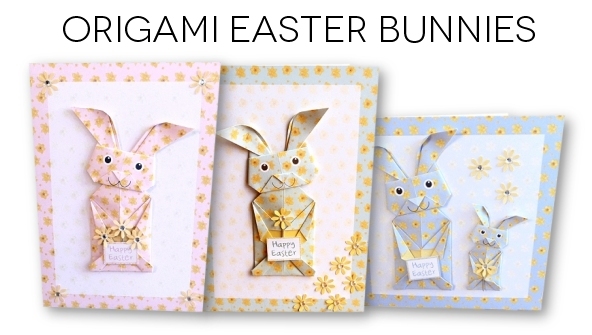 Make wonderful, unique Easter cards this year with this fabulous Origami Easter Bunny card kit! These 2-part Easter bunnies are just as easy to make as our origami cats and dogs using our step-by-step instructions - couldn't be simpler! Each kit features 6 x A4 sheets. Looking for an exciting idea for Father's Day and men's birthday cards? 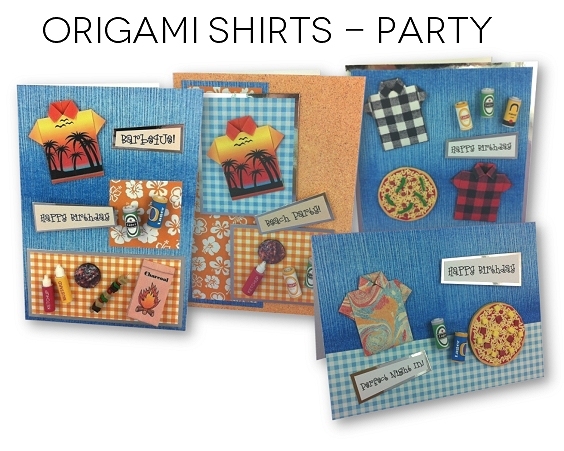 Look no further than these fabulous party origami shirt card kits! The icing on the cake with these card kits are the fantastic miniatures including miniature BEER and Cola cans, mini pizzas and burgers, ketchup and mustard bottles and a great bag of 'charcoal', ideal for barbeque card designs. Origami swimsuits are the big thing this summer - everybody's making them! Our fantastic card kits include swimsuit papers that are ready-printed with guidelines that make swimsuit folding a real doddle! Not only that - we've teamed these fab swimsuits with some cute miniatures - a scrumptious cocktail, great suntan lotion, sunglasses, ice-creams, orange slices to cut out and much more. 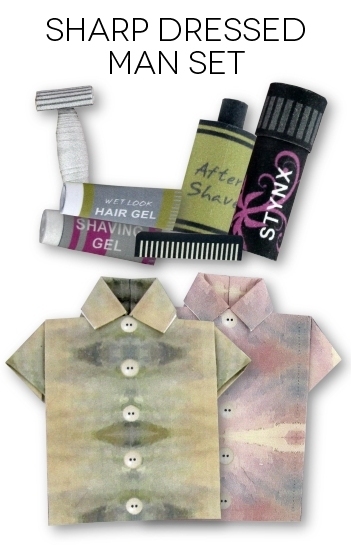 Here's another two kits featuring origami shirts. One with a Scottish football shirt and miniature lager cans and one with a check shirt and a whiskey bottle. This Sharp Dressed Man set features 24 sheets, all A4 in size that you can use to make up our great card designs or for your own ideas. 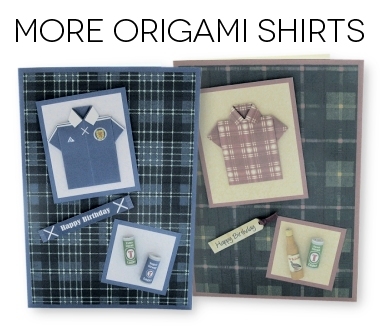 Our origami shirts are a doddle to make up. They have pre-printed guide-lines and are already exactly the right size to make perfect shirts - no more trying to work out which way up to have it when you start folding! There are fab miniatures too - you'll love our miniature 'Stynx' deodorant can, razor, after-shave, hair gel and shaving gels. 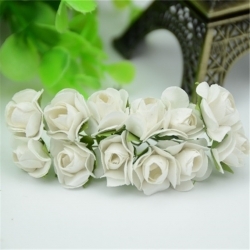 They're so simple to make in minutes and really do add a little extra something to your designs that will really make the recipient smile! Please note that the software box shown above is for illustrative purposes only - the DVD is printed, supplied in a plastic wallet and sent in a sturdy cardboard disc mailer. This compilation © Printable Heaven 2014. 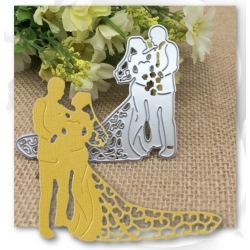 You are free to make and sell cards with the sheets, however you may not copy this disc! 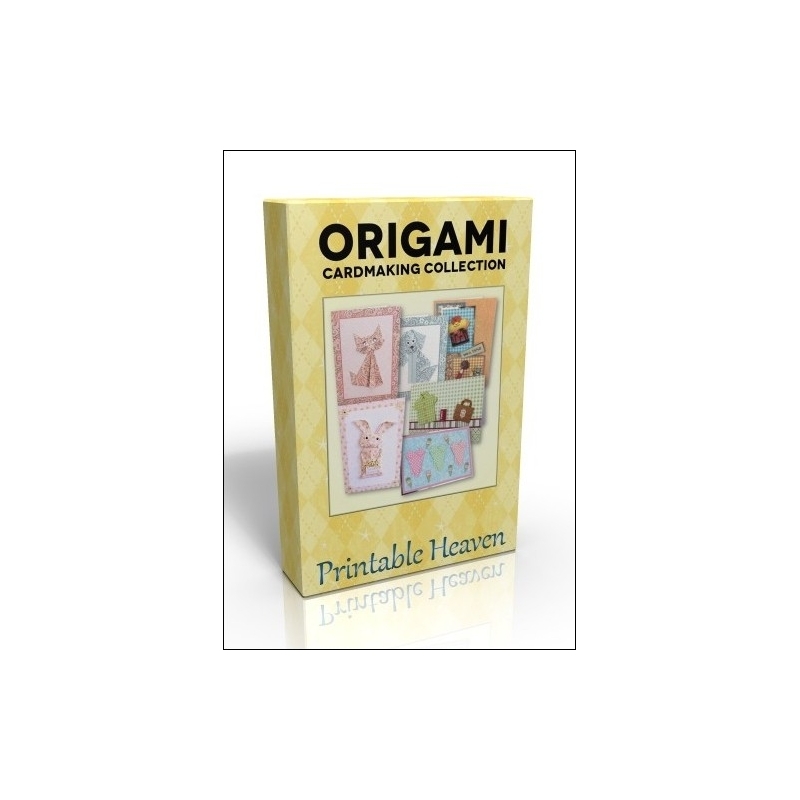 This DVD is crammed full of 21 digital card kits, each featuring an origami embellishment such as cats, dogs, bunnies, shirts or swimsuits. 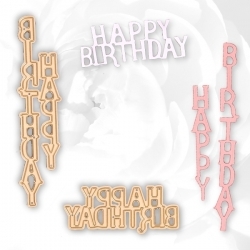 Some of the kits also include miniatures to print and make for an extra special card. There's also another set of 24 sheets to make even more cards. In total there are over 150 sheets on this DVD to print and fold! 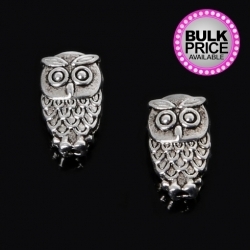 Pack of 8 cute little metal silver-coloured owl charms, each of which has a top to bottom hole. 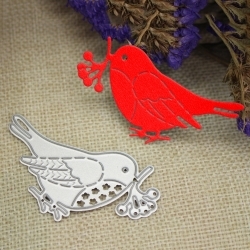 These charms are double-sided (front and back are the same) so they can be used in jewellery as well as for cards and crafts.Made from a zinc alloy. 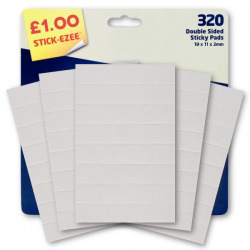 11mm tall.BUY 10 PACKS AND SAVE 32%!